Here we are in August already! Although my daughters are grown, we still live with the rhythm of academia because of Peter’s teaching schedule at the University of Bridgeport’s College of Naturopathic Medicine. The familiar habit of packing lunches for school days is as relevant as ever to our family. We all deal with how to manage busy lives, whether we still have ties to the world of education or not. Staying healthy and making sure that we take time for ourselves is just as important either way. I love talking to people about how they manage the stress and hustle of everyday life and I am constantly learning about ways to simplify and streamline our “life systems,” so that we are supported, healthy and grounded through it all. Although I have found some ways to keep my life in balance with these methods, I always love to hear what other people do to avoid the pitfalls of an overly busy life. Send your tips and tricks to us in an email and you just might see your response in an upcoming newsletter or social media post! Keep an eye out over the next few months, we just might share your responses on our social media pages. Making time for connecting with people we love and with ourselves is the most important thing we can do. I actually schedule in two, one-hour chunks of time during the week for me – quiet, down time, no external pressure, no commitment, no running to and from meetings or obligations. Just unstructured time, spent in solitude, with a journal so I can let my mind wander and see what comes from it. It reminds me of growing up, when we had completely open summer days to explore whether it was down by the creek or in the woods. There was peace in this time devoid of strict structure. So remember, no matter how busy life gets, take the time to slow down, plan ahead and connect with yourself and those you love. Eating at restaurants is one of the true joys of life. Whether it’s to enjoy new, exotic flavors during vacation or simply a trip to an eatery down the road to save you the stress of cooking one night, dining out is always fun. But all this fun can turn into digestive distress and pain if you decide to neglect your Blood Type Diet program when you dine out. Why turn a great experience into a negative one? While many people believe that eating on the go is something that will inherently be problematic for their diet, there are a few simple, straightforward tips that can keep you compliant no matter where you are! Most modern restaurants let you see the menu online before ever leaving your house. Take a look to see what will work best. If this isn’t an option, just use your common sense! Places that specialize in unhealthy foods like burgers and fries are probably best avoided even if they offer a few other options. Proteins are the building blocks of a meal. If you know the ones that best suit you, it will be easy to find a meal that will be good for your diet. Below is a list of common beneficial proteins for each type. While knowing the main proteins for your type is simple enough to remember, all the vegetables and sides that can pair with your meal can be trickier to remember. 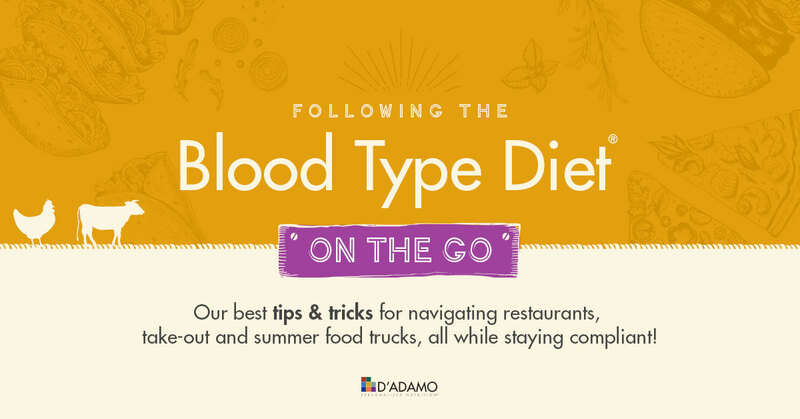 Download the Blood Type Diet App (iPhone or Android) so you can check values on the fly. Don’t let forgetfulness harm your efforts! Most restaurants are more than happy to swap one ingredient for another, especially when side dishes and vegetables are concerned. Don’t be afraid to ask your server about omitting or substituting certain ingredients if you find a perfect dish for you that is marred by one ingredient. Some restaurants have a habit of piling your plate with several meals worth of food. While the value factor of these locations is quite nice, the same can’t be said for the effect it will have on your stomach. Pace yourself and portion out the dish when it arrives, eating only the proper amount and saving the rest to take home. Leftovers are never a bad thing. We have all been there. You tried to pick a healthy place. You substituted and selected as best you could. But there’s still avoids on your plate. In these regrettable situations, you can save your gut distress by popping the right Deflect for your type [ O | A | B | AB ]. It will combat the harmful lectins you ingest to make the effects of a bad decision weigh less on your health. 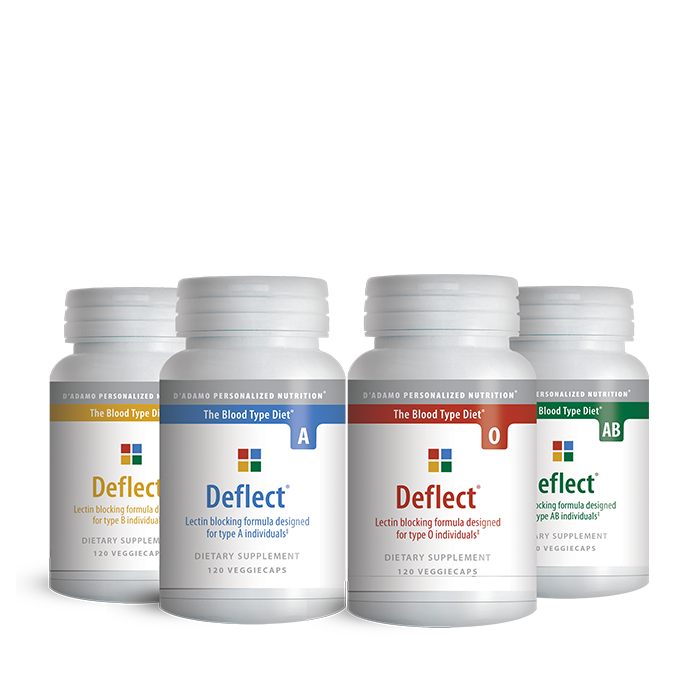 Deflect is the core product for D’Adamo Personalized Nutrition, and for good reason. At the center of the Blood Type Diet concept are lectins, the little proteins that react differently to foods depending on your blood type. They can be the source of inflammation, digestive distress and so many other problems within your body. Deflect, available in a special formulation for each type [ O | A | B | AB ], is your shield against lectins that are harmful for your type. When you eat a food that may not be the most beneficial choice for your type, Deflect goes to work and combats the negative effects of that particular food’s lectins. With our main article focusing on how to stay compliant on the go, no product is a better companion. If you find yourself in a situation where your only options aren’t optimal for your type, having a bottle of Deflect with you can be a life-saver. I went to the doctor for my latest checkup 8 months ago and was told I needed to eat better. My cholesterol was high, my weight was far from where I wanted it to be and to top it all off, I felt sluggish. My doctor’s comments were hard to hear, but not altogether a surprise. I told the doctor I was going to try Eat Right 4 Your Type, recommended by my friend for my husband a few years back, and if that didn't work, I'd take medication if things hadn't changed. Since I was more motivated than ever to make a positive change, I decided I had nothing to lose by trying the Blood Type Diet for myself. I knew I was Blood Type O and immediately started to change my diet to follow suit. Some of my usual choices like cauliflower, coconut, yogurt and avocado turned out to all be avoids for me. Though they were trendy health foods at the time, according to Dr. D’Adamo’s book they were not right for me. To my surprise, cutting these items from my diet and incorporating beneficial foods for my type began to change my life. Pretty soon after starting I had better energy levels in addition to more regulated, healthy digestion. In just the first two months I had lost 20 pounds and by the third month I was down 30 in total. The next time I went to my doctor she not only noticed my impressive weight loss and increased stamina, but also saw that my cholesterol had dropped by 50 points; which put me well under the high and normal range. 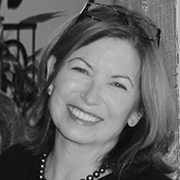 Before the Blood Type Diet, I was nearly ready to take medications to deal with the problems I was having even though so many of my body’s negative reactions were coming from foods. The fact that I was able to naturally combat these issues made me see that Eat Right 4 Your Type was correct all along. Food can have such an impact on your body and in so many ways that go beyond just weight. Though I do miss some of the foods I used to eat regularly, the benefits far outweigh the cravings I get, and as time goes on you want the bad foods less and less. I do sometimes still have my guilty pleasure, dark chocolate, but because I eat healthy now, I have achieved balance for my body. 8 months and 35 pounds later I am a true believer in the diet. Between the substantial weight loss and the total change in my body’s energy levels and digestion, I will continue to follow the diet and recommend it to everyone I know! Health24 talked about the importance of a personalized diet based on advice from dietician Mpho Tshukudu. Food.ntv.com discussed the impact that blood type can have on heart attack risk. Harper's Bazaar Saudi Arabia interviewed our recipe consultant Lea Sednaoui about her life including her compliance to the Blood Type Diet and how Eat Right 4 Your Type changed her. Used in cooking since 600 b.c., turmeric is the root of a tropical plant in the same family as ginger. Though native to the Orient, this spice is now cultivated in India and the Caribbean as well. It has an earthy, slightly bitter flavor and an intense yellow-orange color. 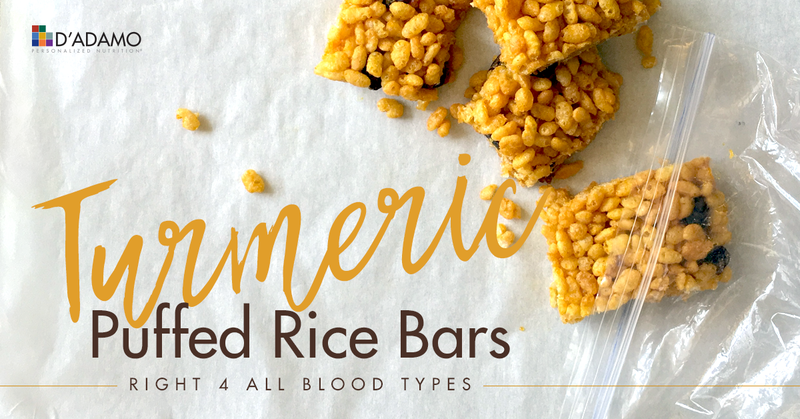 Turmeric is a powerful antioxidant and a great addition to these simple puffed rice bars. 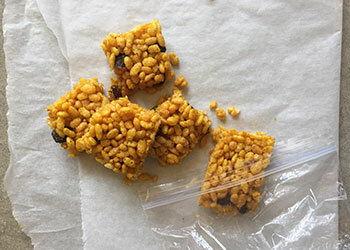 Reminiscent of childhood treats, these puffed rice bars make for a fun snack that are still healthy and guilt-free! Mix the ghee with the turmeric until smooth. 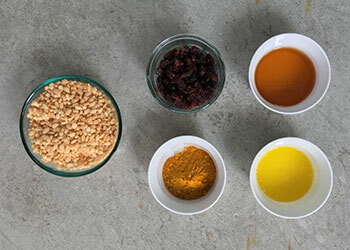 In a large bowl, mix together the puffed rice, honey, dried cherries and turmeric-ghee mixture from step 1 with a spatula until all ingredients are well combined. Transfer the mixture to a 14x10 inch pan and spread evenly with the spatula. Place a baking sheet over the puffed rice mixture and flatten it with your hands to pack it firmly in the pan. Place the puffed rice pan in the freezer and freeze for two hours. Cut out the bars to your desired size; they will be ready to eat as soon as they leave the freezer! Try breaking the bars up and eating them as cereal in a bowl of almond milk. Blood types AB & O non-secretor should replace honey with agave syrup.